Spite is a science-fiction live-action role-playing game set in the near future of planet Earth. An insect-like alien race called the Dromanae have invaded and the humans are losing the war. Players will take on the roles of characters fighting in the war effort against the alien menace and may have the chance to change the course of human history. Spite has two game runners who act as general managers, game writers, and heads of plot. Ron Leota, VP of Operations for NW RPGs (the parent company of Spite) and producer of the NW Nerdcast podcast (nwnerdcast.com) and Matt Oostman, CEO of NW RPGs and a seasoned game runner of over 15 years experience. Matt and Ron met running plot for Alliance Seattle from 2011 – 2014. 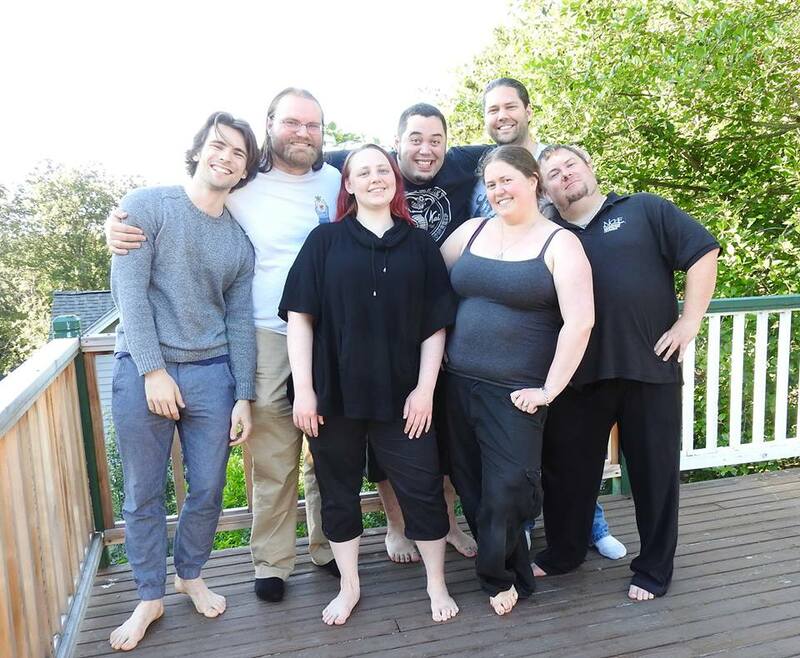 They are joined by Kirsten Olin, Marc DeArmond, Brian Johnson, Raissa DeArmond, and Brooks Donohue who each bring years of LARPing and writing experience to round out the plot team. Our logistics team is lead by Barb Martin and our Technomancers (IT) is run by Jimmy Hastings. A number of experienced colleagues make-up the rest of Spite’s core staff, providing other services and community support. Where will Spite be held? Spite will be at St. Alban’s Camp for the 2018 season. This site will also act as Spite’s IG location to add to the what-you-see-is-what-you-get style of game. Anyone 18 or older who has a good attitude and is willing to work towards making a fun game for everyone. Spite is a physical game played outdoors. While we do our best to accommodate everyone, summer camps have many areas that aren’t accessible to wheel chairs and those with physical disabilities may encounter issues outside of our control. We leave it up to our players to decide whether it’s a good idea to participate in the game. When was the first game? April 24 – 26, 2015. What happens if the game “sells out”? If we get close to selling out the camp with prepays, we will let the community know. An accepted pre-pay is a guaranteed spot for you at the game. We do not expect to sell out, with the larger sites we’ve been renting. Did the price go up? Yes, the price was increased $10/participant. This occurred due to the new site being more expensive than our original sites that couldn’t support our numbers any longer. We strive to keep Spite as affordable as possible, without becoming a financial burden to the staff. This increase allows us to make site costs, cover insurance, purchase props for the game (dozens of bug suits don’t make themselves), etc. We appreciate your understanding. Is Spite a for-profit game? No. The many people working on Spite (including the owners) do this as a labor of love, for the community. No one on staff receives monetary compensation for running Spite. We just appreciate the smiles and hype you bring. We believe that larping is a community experience that the players create, just as much as the staff. How many games will there be a year? Inspired by huge European games like Maelstrom and the NW’s very own Zombie, Spite will host a limited number of events (2 per year). Maelstrom and Zombie run about once a year and have huge turnouts, we want events to be big deals with a lot of players. This will also allow players to play the game who don’t have time for a “regular” LARP schedule. We also intend to avoid booking over other NW games but that isn’t always possible. Does Spite have a definitive ending? Yes. Game 10 will be the last game of Spite as we know it. There isn’t a definitive plan to continue the game, after the ending but there are ideas in the works. We believe, as a story telling team, that all good stories come to an end. We feel larps are no different. If Spite only has a few games left, is it worth coming as a new player? Absolutely. We strive to make every game a great experience by catering to all players, not just those who have been playing long term. There will be content for new players to enjoy, even if game 10 is your first and last game of Spite. Where can I find the rulebook and setting materials? The spite rulebook can be found on the “rulebook” link in the main links bar of this website. The SIC handbook and UEF handbook can be found here. The CG Handbooks can be found here, under the public OOG forums of the specific CG. What are Hive Points and Downtime Actions? Is this game based on this other space bug/alien invasion movie, rpg, game, book, cave drawing? While Spite takes inspiration from many intellectual properties, Spite is not officially affiliated with any of them. If you feel we are blatantly ripping anyone off, please let us know so we can change it, that’s certainly not our intention. What type of media could I consume to get ready for Spite? We at Spite love our influences and our proud to share them with you. Please consider checking out the following media for inspiration on your Spite characters: Starship Troopers (film & book), Aliens (film), I, Robot (book), Predator (film), Shadowrun (RPG), Attack the Block (film), District 9 (film), Rifts: Xiticix Invasion (RPG), Blade Runner (film), A.I. (film), and many others. What are the rules of posting to this group / being a part of Spite? We’d really like to encourage the growth of a healthy, constructive, and collaborative community. We want to make sure that we’re attracting players who also want to be a part of that community. When someone new joins the group who doesn’t know everyone, the only thing we have to judge this organization and our fellow players on is their words and treatment of the people around them. We each represent our community when we have these sorts of conversations, and if necessary we’ll prune comments and members to ensure that our community can grow without hindrance. We would rather run a good game for fifty good players than an aggressive, stressful game for a hundred. I have a great idea for the game, a question that wasn’t answered here, or I’d like to contact the creators or whole plot team, how do I do that? That’s easy! Email our community admin at communityadmin@spitelarp.com. How do I get a hold of plot?